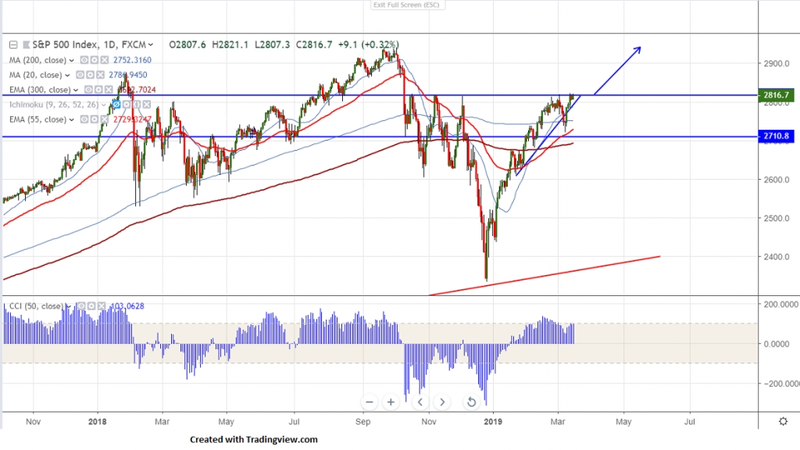 S&P500 recovered slightly after a forming a top around 2821 on positive Brexit news.The index was trading higher nearly 2-1/2 month and jumped more than 20% from low of 2334 on easing US--China trade tensions and increasing risk appetite. It hits low of 2720 Mar 08th 2019 and is currently trading around 2820.3. The index’s near term support is around 2798 (23.6% fib) and any break below 2784 (20- day MA) and any violation below will drag the index till 2748 (200- day MA)/2720/2700. Any violation below 2680 confirms further weakness. On the higher side, major resistance is around 2821 and any break above will take the index to next level 2840/2860/2930. It is good to buy on dips around 2805-10 with SL around 2785 for the TP of 2930.